When I first entered the client for the upcoming free-to-play MMORPG in development by Cryptic Studios and published by Perfect World Entertainment, Neverwinter, I was immediately impressed. Title screens for games are, by definition, the first impression you get and I often feel like they are overlooked. While it’s still in beta and very much a work in progress, I couldn’t help but be immersed right away into the wonderful theme music and dragon sweeping in from the background. Go ahead, watch the video below. It really is quite an impressive tune. I had the pleasure of being invited to this beta by Perfect World Entertainment, but the press exclusivity is only very temporary. You can check out my previous post about the beta events here to see the full schedule of times and ways you can enter. Now, let’s get into the nitty-gritty of what all this game has to offer! Once I began character creation, I was once again impressed. For any one that has ever played the 4th Edition ruleset of the Dungeons and Dragons tabletop game itself (of which you can hear me talk about some of my first experiences with here) you will notice a lot of references. Each of the races available in the beta had their trademark abilities and looked exactly like you would expect from traditional D&D high-fantasy designs. As of the beta I could pick from: Human, Dwarf, Elf, Half-Elf, Halfling and Tiefling along with a silhoutte labeled “comign soon”; I chose half-elf for my first character because his stat bonuses fell in line with the paladin-esque warrior I planned on creating. After choosing my race, I got to check out the classes. This beta only had three classes available, but two others have been confirmed for release. The available classes in the beta were Guardian Fighter, Trickster Rogue and Devout Cleric. At launch, gamers can also check out the Control Wizard as well as the Great Weapons Fighter. Continuing with my theme of creating a paladin-esque warrior, I of course chose Guardian Fighter. The video below details the entire creation process. After this choice, I got to “roll” for stats. This is yet another great specific reference to the table top game action of literally “rolling dice” to determine your stats. If you didn’t know, this is where the term “rolled a mage, rolled a warrior, etc.” comes from in MMOs and RPGs in general. Once I was happy with my character’s general makeup, I got to customize his appearance. The options were quite extensive and I could have easily spent upwards of an hour messing with options and sliders here alone, but I stuck with some traditional warrior looks, scars and face tattoos and sent him off into the world! 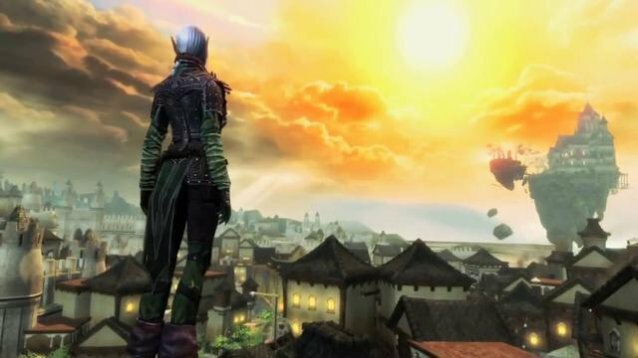 Once landing in the world of Neverwinter, it gives you a moment to get your bearings. Controls and basic interaction buttons are presented in an easy to understand tutorial format, but genre veterans won’t have a whole lot of trouble adjusting. There are a few key shake-ups to take note of here, however. Note: The following controls are only of my charcter, a Guardian Fighter, so variations very likely occur for other classes. First and foremost is how the mouse functions: the screen has a cross-hair, not a mouse cursor. I “steer” my character by moving the mouse, not right clicking and rotation. Pressing shift held up my shield (which drains my block meter over time and as I block attacks.) Left click is my attack button. Instead of clicking an enemy to target them and pressing the number “1” to turn on your auto attack, you actually attack in real-time with your weapon where you aim the cross-hair. For any one that has played an MMO before, this is a pretty drastic, althought not wholly unique, change to the system. Other recent games have been making a move in this direction, so time will tell if it eventually becomes the new norm. Check out the below video for my full playthrough of the opening sequence! Your abilities are essentially taken, once again, directly from the 4th edition ruleset. You have your “at-will” powers, or the abilities that can be performed at any time. This comprises my basic attacks, the ones I will use throughout combat. Next are what’s called “encounter” powers. In actual D&D, these powers can only be used once per encounter, or battle. In Neverwinter, these abilities are on traditional cooldowns after use. Finally are your powerful “daily” powers. As you may have guessed, in actual D&D, these powers can only be used once per day (sort of a nebulous term, you regain them after resting, as well as other nuances, but essentially once a day.) In Neverwinter, you build up your “action point” gauge (another term/concept taken from D&D) and once it’s full, you can use a daily power again. These concepts work great because they fall in line with traditonal MMO game design, but are also unique and draw influences directly from the D&D source material. Once I finished up the opening sequence and slayed a big nasty Harbringer creature, I got my nice loot chest and entered a portal that sent me off to the main town! After reaching the main city, I did a bit of site seeing and exploring. There really are a lot of things to do, places to see and people to talk to. The development team did a really nice job of bringing the titular city to life once again. Granted, it is still beta, so the city does not have as much life as a fully-launched MMO would. After familiarizing myself with the city and the game itself a bit more, I decided to go off on my first quest. When you have a quest selected in your log, a glowing trail on the ground appears to direct you exactly where to go. This is useful in the large city, because it is fairly easy to get lost if you’re not paying attention. The quest set me off venturing into a cave/basement and I was soon fighting my way through bandits and other types of baddies. The dungeons/instances do a nice job of retaining the MMO vibe, but also having a heavy D&D influence. For example, when you find campfires, they act as respawn points (video game logic) and rest points to heal and recover (D&D logic.) Yes, I said heal. Your health does not automatically regenerate in this game and unless you’re a cleric, your only source of healing are the campfires or potions outside of battle. I know what you’re thinking “Wait, how can I solo endgame content with my Rogue or Wizard if I can’t heal?” Well, the simple answer is that you probably can’t. D&D has always been founded on the philosophy of working together as a group and playing off of each other’s strengths and weaknesses. The entire “party” system, “holy trinity” concept, etc. began in D&D. Early content like this little cave I could handle fine on my own, but that won’t be the case later on down the line. For the full video of me playing through this first dungeon, check out the video below. By this point, I’ve got more flexibility in combat and can actually enjoy fighting a bit more with my Guardian Fighter. I eventually got the ability to lunge at my enemies from far away by pressing Q which did massive damage and usually killed a normal enemy in one strike. Consider the following example: I spot a group of three enemies down the hallway that have not spotted me yet but are in range of my lunge. After lunging in and taking out one enemy, only two would remain. I could then raise my shield to block their retaliations, lead into a bash with my shield to weaken them and deal extra damage, followed by a few quick slices. After raising my shield again and strafing around to get a better shot at both enemies, while still protecting myself, I finish them both off with a few more vicious slices of my sword. If done correctly, I took no damage and looked awesome while doing it. Strategic combat scenarios like this are what make the game so engaging, especially when your precious pool of health doesn’t magically come back after each fight. Check out the video below for footage of another dungeon. Well, you understand how dungeons work if you’ve ever played an RPG. There are corridors, enemies and loot. However, one of the other main trademarks of D&D are the traps and secrets. As a half-elf Guardian Fighter, I possessed the Dungeoneering ability (once again, taken straight out of D&D 4th edition.) However, instead of rolling dungeoneering dice checks, it works on the fly. While passing through a hallway, I could spot a trap on the ground and know to avoid it. I even realized a bookcase could be spun around to reveal a hidden chest. This once again reinforces the party dynamic – a Control Wizard would not be able to locate these things, team work is heavily encouraged. As of the time of this writing, I did not get the chance to participate in PvP, group up with anyone, interview the developers or check out The Foundry. Let us know your thoughts on what you’ve seen of the game in the comments below and be sure to check out the details on other beta events right here. UPDATE 1: Here is my interview with Lead Producer, Andy Velasquez. UPDATE 2: Open Beta is dated, full details here. Are you excited to return to Neverwinter after all these years?